FITC conjugated Mouse anti Human CD6 antibody, clone MEM-98 (MCA1880F) used for the evaluation of CD6 expression on human lymphocytes by flow cytometry. 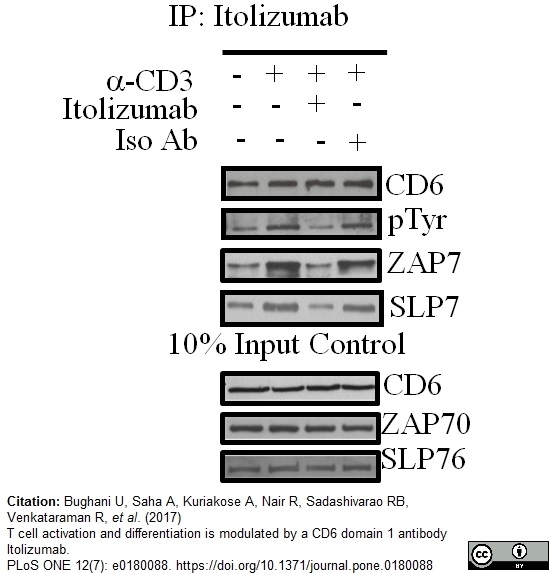 CD6 receptor on lymphocytes is not internalized and is occupied with Itolizumab. Human PBMCs were left unstimulated or stimulated with soluble anti CD3 0.5 ng/ml (OKT-3) in presence of Iso Ab or Itolizumab at 10 μg/mL for 3 days. Post stimulation, cells were harvested and stained with anti CD6 Ab, MEM-98 clone (A) and anti-human IgG, Fc specific (B). In panel A, since the CD6 receptor is occupied with Itolizumab, MEM-98 (commercially available anti CD6 D1) could not bind in Itolizumab treated groups and hence no signal is observed. The positive signal with anti-human IgG, in Itolizumab treated group in panel B suggests that Itolizumab is occupying CD6 receptor on lymphocyte surface. Data is representative of at least 3 independent experiments. T cell activation and differentiation is modulated by a CD6 domain 1 antibody Itolizumab. Mouse anti Human CD6 antibody, clone MEM-98 (MCA1880) used for the evaluation of CD6 expression CD6 immune precipitated samples by western blotting. (A) CD6 Western blot of CD6 immune precipitated samples using MEM-98 antibody. Mouse anti Human CD6 antibody, clone MEM-98 recognizes human CD6, also known as T12 or TP120. CD6 is a ~100-130 kDa type 1 single pass trans-membrane protein member of the immunoglobulin superfamily. CD6 possesses 3 scavenger receptor cysteine rich (SRCR) domains in it’s extracellular sequence. The membrane proximal SRCR3 contains the epitope responsible for interaction with CD166, also known as Activated Leukocyte Cell Adhesion Molecule (ALCAM) or CD166. Multiple gene transcripts have been detected encoding CD6 in man resulting in the production of a number of CD6 isoforms. Mouse anti human CD6, clone MEM-98 recognizes an external epitope located in the membrane-distal SRCR domain 1 and is expected to recognize all CD6 isoforms so far identified, CD6A-E.
CD6 has been implicated as a therapeutic target for a number of autoimmune conditions (Pinto et al. 2013) including Sjögren's syndrome (Ramos-Casals et al. 2001) , rheumatoid arthritis (Rodriguez et al.) and psoriasis (Wilsmann-Theis et al. 2006). Spleen cells from immunised mice. Bazil, V. et al. (1989) Monoclonal antibodies against human leucocyte antigens. III. Antibodies against CD45R, CD6, CD44 and two newly described broadly expressed glycoproteins MEM-53 and MEM-102. Folia Biol (Praha). 35 (5): 289-97. Nair, P. et al. (2010) CD6 synergistic co-stimulation promoting proinflammatory response is modulated without interfering with the activated leucocyte cell adhesion molecule interaction. Clin Exp Immunol. 162 (1): 116-30. Castro, M.A. et al. (2007) Extracellular isoforms of CD6 generated by alternative splicing regulate targeting of CD6 to the immunological synapse. J Immunol. 178 (7): 4351-61. Hassan, N.J. et al. (2006) CD6 regulates T-cell responses through activation-dependent recruitment of the positive regulator SLP-76. Mol Cell Biol. 26 (17): 6727-38. Garner, L.I. et al. (2018) CD6 mAbs differ in epitope, kinetics and mechanism of action. Immunology. May 17 [Epub ahead of print].